ATV Race Results and ATV Racing Stories, helmet cam footage and more. 2013 Season Race Stories and recaps. If I wrote a story for the race the link can be found here. WORCS round 3 Havasu Open A 9th, 30+ A 5th. 2012 Season Race Stories and recaps. If I wrote a story for the race the link can be found here. AZ GP Team race Tucson 5/26/12 Expert 1st, raced the Raptor for this one. SCORE San Felipe 250 450 Pro 6th, joined another team for this one. 2011 Baja 500 Sportsmen 55A 4th, we finished! I wrote all these stories a day or so after the race happened. I wrote these stories for my friends, so they are meant to be funny and sarcastic. 2007, Whiplash Open Novice 2nd place overall. My background story on ATV's and racing. My Garmin GPS Heart Rate data log. These links show my location, speed and heart rate during a 90 minute GP race in Arizona. Pretty cool stuff! These pages take a while to load. Race 2, 100 mile race in 2008, Heart rate strap wasn't working. There are quite a few tracks close to Phoenix for a full listing click here. I will post my impression of each track from a quad riders point of view here. Between the amx series and the monthly MX races that the tracks put on you could easily race every weekend if you wanted to. ET Motopark- Hotline number- 480-926-6688. This track is closest to me so I consider it my home track. The entry fee is $25, I wish it were cheaper. On the weekends all 3 of their tracks are open this includes the pee-wee track, the north track ( I call it the quad track ) and the south track which is their large motocross track. The quad track is the very first mx track I ever rode. It was a blast and I was hooked. It has several table tops, a double-double section and no whoops. It is great for learning and you usually don't have to worry about getting run over by a motorcycle because they stick to the big track. Their big track is also a lot of fun. There is a fun little step up alley oop type jump just after the starting line. There are some smaller pit jumps, a triple step up, some big table tops, a tunnel and some nice big turns. They are open most saturday and sundays and I believe tuesday night is open for quads, check their site for more info. Speedworld- 623-546-1206. This track is quite a bit different than ET. It is a true national style track with long uphill jumps and lots of blind downhill landings. My first few laps I was very intimidated by the jumps but after a while I was doing pretty good. They also have a true MX style whoops section that will really beat you up. Speedworld is open quite a bit, check the site for practice dates. They also have a lot of events. I entered my first real race here during their beat the heat series in August of 2006. It was a lot of fun and the beginner quad class had a full gate of 24 racers. Speedworld also has a smaller MX2 track that I didn't get to ride and they have a short vintage track with some really fun bowl turns and little jumps. They also have sandrags now and flat track racing for quads, bikes and outlaw cars. Whiplash Racing- This is an Arizona race series for racing on natural terrain in the desert or up north in the forrest. The races are quite long usually 4 laps with each lap lasting 15-30 miles. I did a practice session on their Snowflake, AZ course in August and it was a blast. I look forward to entering some races in this series. They have classes for quads, bikes, rhinos, and trucks. 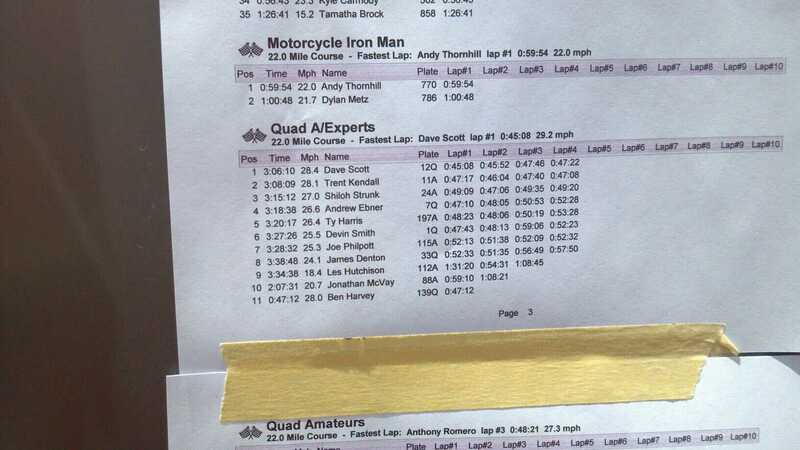 ITP Quadcross- This is a larger race series for motocrossing quads. I believe they make 2 stops in Arizona in 2006 and it should be fun. WORCS Racing- This is another large race series for quads and motorcycles. They make 1 or 2 stops in AZ and the course is a combo of MX and desert racing. Best in the Desert, BITD Racing- This is a huge racing series for a lot of the Baja 1000 type guys. Arizona Motocross (AMX)- This is the organization that put on the beat the heat race that I participated in at Speedworld. They have classes for all skill levels and ages. I had a great time and it was my first event. Check out their schedule and maybe I will see you at a race. This topic seems to come up a lot because people want a bike that is fast. Whenever I end up at the dunes my friends and I inevitably end up drag racing up an down the sand highway. My bike really isn't that fast but here are some results. My bike ( 05 TRX450R- filter, 180jet, muffler cap) vs DS650. My friend has a Bombardier DS650. We raced several times and he starts to pull on me in 3rd gear, it could be that I weigh 210 and he weighs 140 soaking weight, who knows. My bike (05 TRX450R- filter, 180jet, muffler cap) vs Stock 06 450R. After I bought my TRX my dad went out and got an 06 version. They have more power stock, how much more? My bike with minor bolts o ons is a direct match for his bike. With an equally weight friend on the 06 we are dead even. Then we swapped bikes and had the same result. My bike (05 TRX450R- filter, 180jet, muffler cap vs 06 450R with HRC kit. This isn't much of a race. The HRC kit really makes the 06 scream. I have seen dyno charts in the high 40's with just the HRC kit, whereas my bike probably makes 35hp.